With our supplier being Everbuild for PVA, we can ensure that we have all you need in terms of PVA products. We stock PVA for waterproofing, bonding, sealing and priming surfaces. With many of the products being multi-purpose, it means that you can use the product for many different projects. Our PVA comes in many sizes and for many purposes. 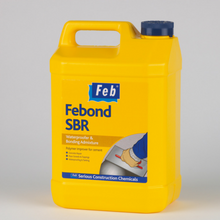 Febond SBR is a styrene-butadiene co-polymer latex specifically designed for use with cementitious mixes and as a reliable water resistant bonding agent. Ideal for concrete strengthening and repair, floor screeds and toppings, waterproofing and tanking. 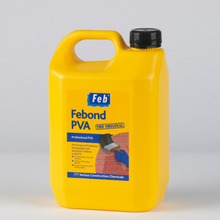 Febond PVA is the original multi purpose quick drying PVA adhesive, sealer and bonding agent and cement admixture which has many applications in the building and construction markets. Ideal primer and sealer for concrete and plaster.